Libraries across the country are utilizing facilitation kits to provide more structure to their programming plans, and check-out kits to help their patrons take the experience home. Whether you’ve never used a kit before, or consider yourself a kit pro, these resources will provide you with prototyped and tested activities and resources to use with your patrons. Click into the topic areas below to see examples and resources from the STAR Library Network, State Libraries, and other STAR Net project partners. We hope this area addresses everything you need to know to get started with kits, but if you think we’re missing anything, let us know! Kits for children or youth (45%) and families (27%) are the most popular. Libraries are providing kits designed for all age ranges – birth to adult – but ages 6-9 and 10-12 years old tend to be the most commonly served. Most kits travel outside of the library to patrons’ homes (81%), and the most common lending period is more than 1 week to up to 1 month (62%). 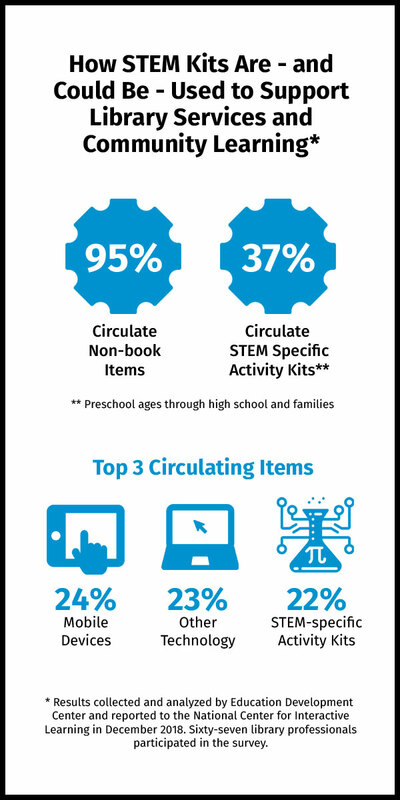 Nearly half of libraries circulate kits within the library (49%); these kits are most commonly checked out for 1 hour to less than 3 hours (or longer). The top two challenges relating to STEM kits are the cost of replacing damaged, missing, or consumable items and providing space for storing and housing kits. Results collected and analyzed by Education Development Center and reported to the National Center for Interactive Learning in December 2018. Sixty-seven library professionals participated in the survey. Note: These materials are intended for use by library professionals to help them facilitate STEM learning for their diverse communities. Multiple files were provided by external organizations and are not necessarily 508 compliant. Photos thanks to African American Research Library & Cultural Center, Kanawha County Public Library, Licking County Library, and the National Center for Interactive Learning/Space Science Institute.